Nova Scotia is the province in Canada, one of three Maritime provinces also known as The Maritimes or the Canadian Maritimes, which consist, apart from Nova Scotia, also from New Brunswick and Prince Edward Island. All in total in Maritimes there are over 1813606 inhabitants nowadays, and 923598 of them live in Nova Scotia, that is why this province is the second most-densely populated one in Canada with over 17 inhabitants per square kilometre. Nova Scotia is also a part of the other four provinces, forming so-called “Atlantic Canada”. The provincial capital of Nova Scotia is Halifax. The province itself is the second on the list of the smallest provinces in Canada: its area is only 55284 square kilometres. Cape Breton Island is also a part of Nova Scotia and it is an island on the coast of Atlantic Ocean in North America. The total area of this island is 10311 square kilometres, which is over 18% of the total area of Nova Scotia province. There are also another 3800 coastal islands which are all a part of Nova Scotia. The smallest Canada’s province in the area is Prince Edward Island and Nova Scotia is on the second place. The province's mainland is surrounded by the Atlantic Ocean, but there are also many different bays and estuaries in the province. 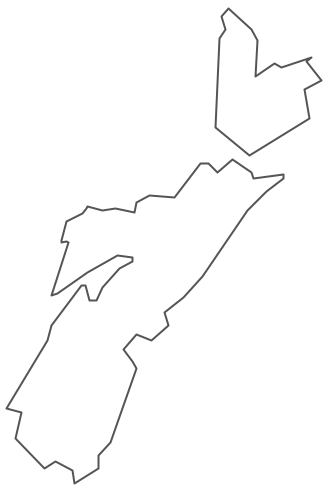 There is a Cape Breton Island, which is the largest one to the north-east from Nova Scotia mainland. This island, as it was mentioned before, is also a part of Nova Scotia, same as Sable Island. There are many ancient fossil-bearing rock formations in Nova Scotia, which can be found mainly in the Bay of Fundy's shores. All together there are in total about 5400 lakes in this province. The so-called “Mi'kmaq” nation is a part of this province. These people inhabited Nova Scotia when the first European colonists arrived in Canada and in 1605 these French colonists established the first permanent European settlement in the future Canada where it is now known as Acadia. The largest ethnic group in Nova Scotia consists of Scottish people as there are over 30% of them living in this province. A little bit less of English people living there, then Irish who are over 20% of all inhabitants. Over 17% French people live there and also Dutch and Welsh can be found as well as Italian and Scandinavian people. But over 40% of the Nova Scotia inhabitants identify themselves as being "Canadian". There are many museums in Nova Scotia, reflecting its ethic heritage, including “Hector Heritage Quay”, “Black Cultural Centre for Nova Scotia”, the so-called “Glooscap Heritage Centre” and “Grand-Pre National Historical Site”. There are also many museums which attract tourists telling the stories of the province’s working history. It is recommended to visit the “Cape Breton Miners’ Museum” and the “Maritime Museum of the Atlantic”. There were a few internationally renowned musicians, such as Rita MacNeil, Anne Murray Centre and Hank Snow in Nova Scotia. There are also numerous cultural and music festivals taking place in this province each year, such as the “Stan Rogers Folk Festival”, the “Nova Scotia Gaelic Mod”, “Celtic Colours”, “Royal Nova Scotia International Tattoo festival”, the “Atlantic Fringe Festival” and “Atlantic Film Festival”, that is why this province is popular for so many tourists visiting it. Another reason for visiting Nova Scotia can be 88 National Historic Sites, 26 of which are administered by “Parks Canada”. They include the “Habitation at Port-Royal”, the “Fortress of Louisbourg” as well as the “Fortress of Louisbourg” and “Citadel Hill” in Halifax. There are two national parks – Cape Breton Highlands and Kejimkujik – in Nova Scotia as well as many other “protected areas”. This place is becoming more and more attractive for tourists to come and visit this province. Acadian Skies and Mi'kmaq Lands (which are in the south-western part of Nova Scotia) are the first certified UNESCO-Starlight Tourist Destination, so it is not a surprise to see many foreigners come to have a look at this province from all over the world. 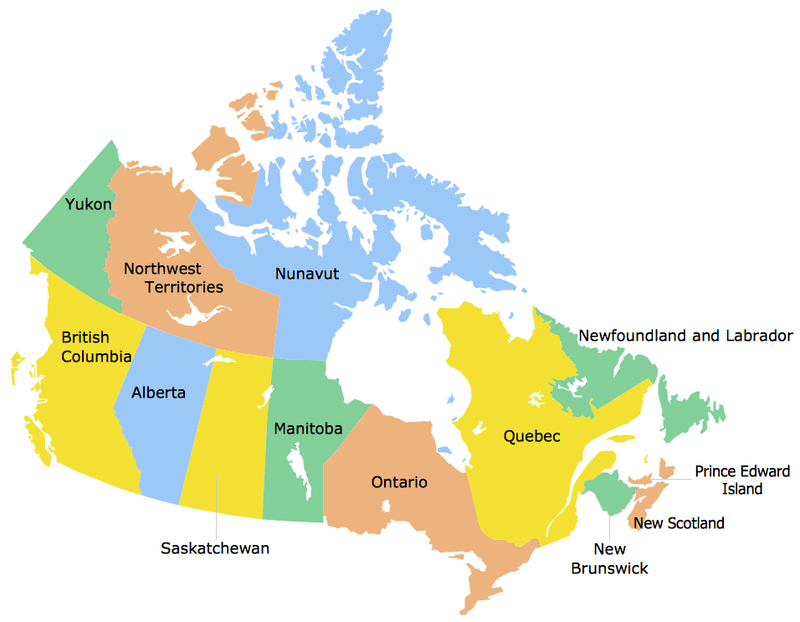 There might be a need for you to draw a map of Canada or Nova Scotia in particular as well as other provinces separately or all together mentioning the population, the area of each province or you might want to create a politic map of this country or its province. It is simple to do it all having a great and very convenient application which is CS Odessa’s product – ConceptDraw DIAGRAM Having this software means having the opportunity to create any needed map as all of the necessary tools are there available for you both in ConceptDraw DIAGRAM as many more in ConceptDraw STORE, which is another application, developed by the professionals of CS Odessa for providing all of the necessary “solutions” containing stencil libraries as well as samples and templates. 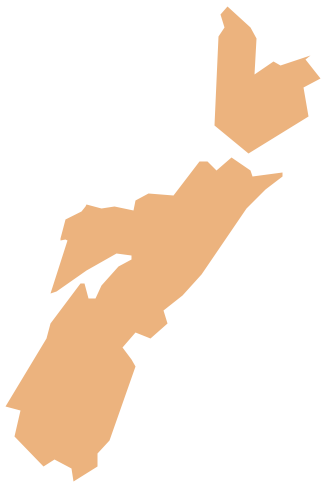 The “Continent Maps” solution offers the vector stencils library “Nova Scotia”, which contains the contours of this province, that can be used for working in ConceptDraw DIAGRAM diagramming and vector drawing software while making your great looking maps. 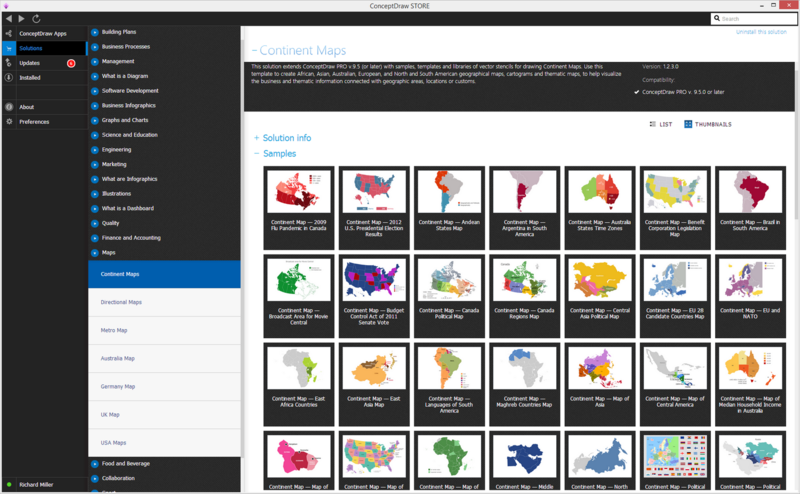 This “Continent Maps” solution as well as the libraries and templates can be found in the “Maps area” of ConceptDraw Solution Park on this site or downloaded from ConceptDraw STORE which, in its turn, can be downloaded originally from this site. There are also other solutions and other libraries, such as the vector stencils library "Canada" containing 15 different map contours, such as “Canada political map”, map contours of Canada provinces and other territories. 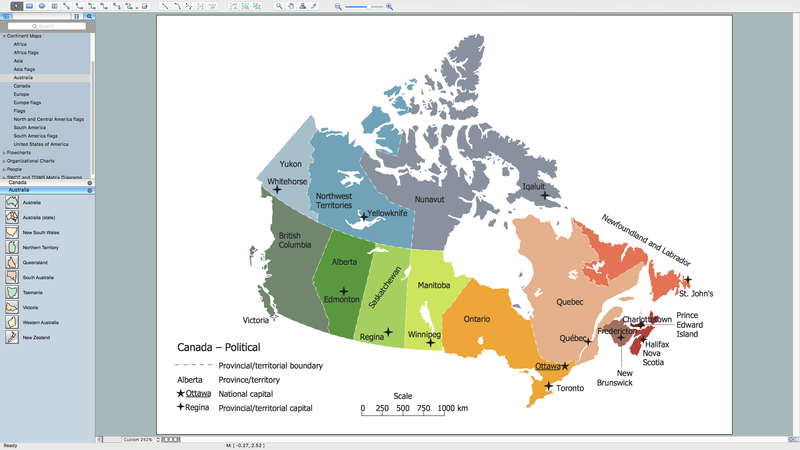 This library "Canada" can be simply used for designing the thematic maps, including the maps of provinces, such as Nova Scotia one. 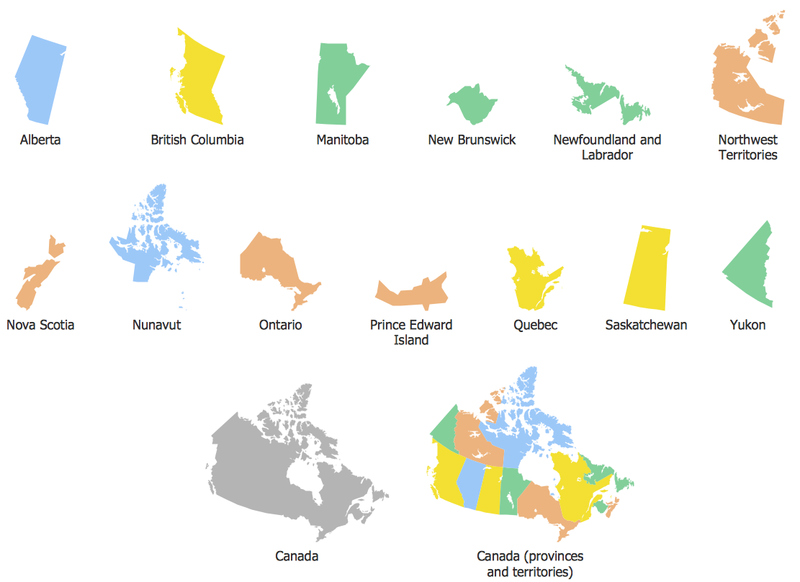 Use this “Canada” as well as “Nova Scotia” libraries for drawing your thematic maps, geospatial infographics and vector illustrations in order to use them in your business documents, presentations and websites. The vector stencils library Nova Scotia contains contours for ConceptDraw DIAGRAM diagramming and vector drawing software. This library is contained in the Continent Maps solution from Maps area of ConceptDraw Solution Park. Use the Nova Scotia library to draw thematic maps, geospatial infographics and vector illustrations for your business documents, presentations and websites. Nova Scotia has a population of over 0,9 million and an area 55,283 km²(21,345 sq mi). Canada is a federation composed of ten provinces and three territories. Area 9,984,670 km²(3,854,085 sq mi). Population 36,048,521. Use the map contours library "Canada" to design thematic maps using the ConceptDraw DIAGRAM diagramming and vector drawing software. 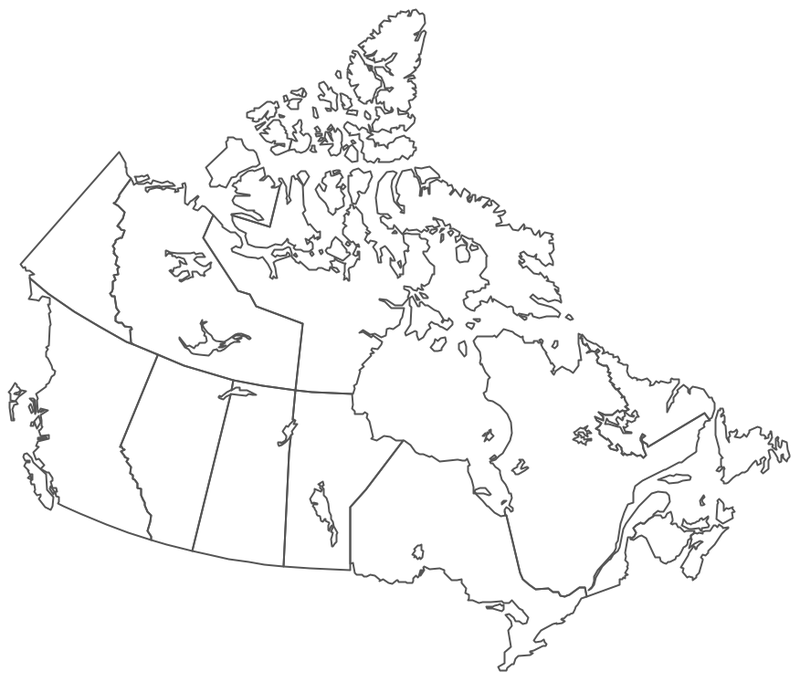 The vector stencils library "Canada" contains 15 map contours: Canada political map, map contours of provinces and territories. This example is created using ConceptDraw DIAGRAM diagramming software enhanced with Continent Maps solution from ConceptDraw Solution Park. Manitoba is a Canadian prairie province. The vector stencils library Manitoba contains contours for ConceptDraw DIAGRAM v12 diagramming and vector drawing software. This library is contained in the Continent Maps solution from Maps area of ConceptDraw Solution Park. Quebec is a province in east-central Canada. The vector stencils library Quebec contains contours for ConceptDraw DIAGRAM v12 diagramming and vector drawing software. This library is contained in the Continent Maps solution from Maps area of ConceptDraw Solution Park. British Columbia, also commonly referred to by its initials BC or B.C. The vector stencils library British Columbia contains contours for ConceptDraw DIAGRAM v12 diagramming and vector drawing software. This library is contained in the Continent Maps solution from Maps area of ConceptDraw Solution Park. New Brunswick is one of Canada's three Maritime provinces and is the only province in the Canadian federation that is constitutionally bilingual (English–French). The vector stencils library New Brunswick contains contours for ConceptDraw DIAGRAM v12 diagramming and vector drawing software. This library is contained in the Continent Maps solution from Maps area of ConceptDraw Solution Park.